Having researched the Internet for dogs that were good for fur allergies, we then went to visit Toni to see if FL’s would be ok for Mark. We spent over 2 hours with Toni and her dogs and Mark did not sneeze once! Meanwhile the whole family had fallen in love with the breed. Initially Kisa nipped a lot and we found it hard to teach him bite control. Pulling on the lead is still something we are working on, particularly in the street environment as we have a lot of foxes and cats roaming around. Sit, down, stay, recall (most of the time- unless there is a more interesting squirrel lurking). 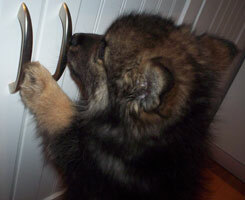 Kisa loves to concentrate on training particularly if food is a reward. Bonding with Kisa, seeing results. Both – depends on time of day. 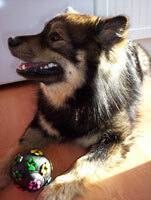 No not now, Kisa was very sick as a puppy until we found a food that was suitable for him at around 9 months. Kisa welcomes everyone as a potential playmate. With four girls in the house he is very well socialised. Mainly great, sometimes he now ignores other dogs, or plays with very young dogs. On odd occasions he has growled and tried to intimidate another male but will stop when demanded/distracted by us. Loves all females, not keen on other males at all! In fact positively jealous! None really, great with horses, ponies (haven’t tried deer) will chase squirrels but we don’t find it a problem as Kisa has good recall most of the time, good with passing dogs, runners, children, toddlers. Kisa does not like swimming but likes going in water in his depth. Happy, clever, keen (to please) mischievous, noisy (at shows). Rescue dogs – mixed breed. FL easier to teach and very quick to learn – grammar school of dogs.